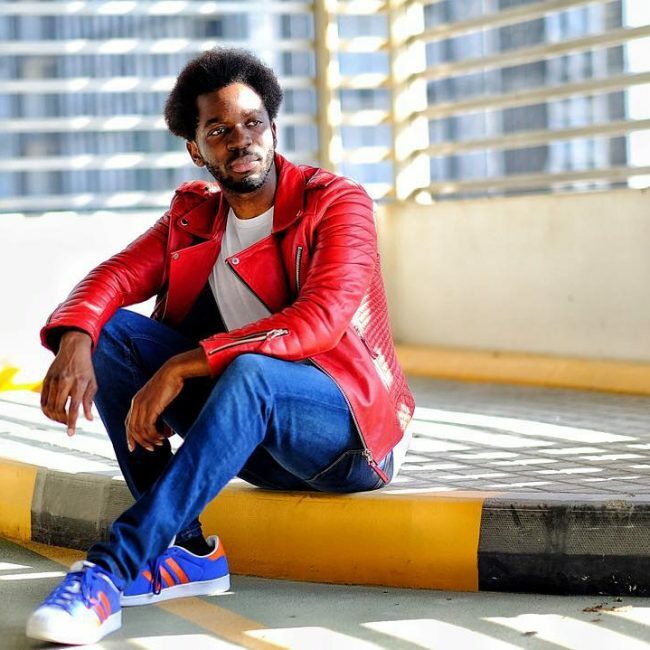 A red leather jacket is a very versatile attire that can go with most outfits whether black, white, brown, blue and so on. 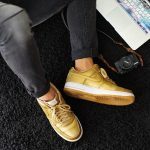 Whether you choose to style it with flannels, ripped jeans, an oversized sweater and so on, you will still look great as long as you match the colors properly. It can go with literally anything whether you are off to a dinner date or fresh out of the gym. 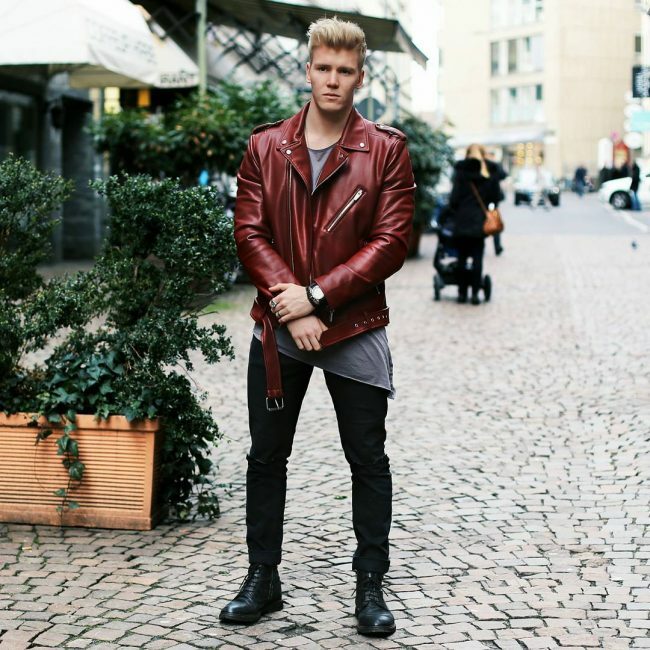 The following some of the great ways that you can use to style a red leather jacket for the perfect look. Who said leather jackets cannot be worn in winter? As you can see from this style, it is very possible. The leather jacket will keep you warm when worn with a T-shirt and jeans. Instead of a T-shirt, you can go for a polo neck if it is too cold outside. You do not have to be a Hollywood celebrity to look this great. 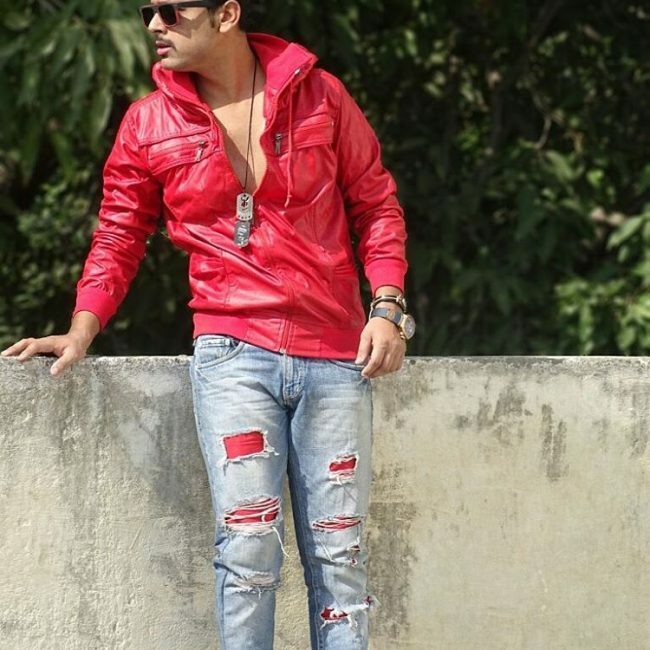 This bright red jacket looks absolutely awesome with the blue ripped jeans that have a touch of red in them. Younger men will find this look to be very stunning. The red jacket and the skin hugging blue jeans look great together. When going out for a casual walk, this is the kind of style you should consider rocking. 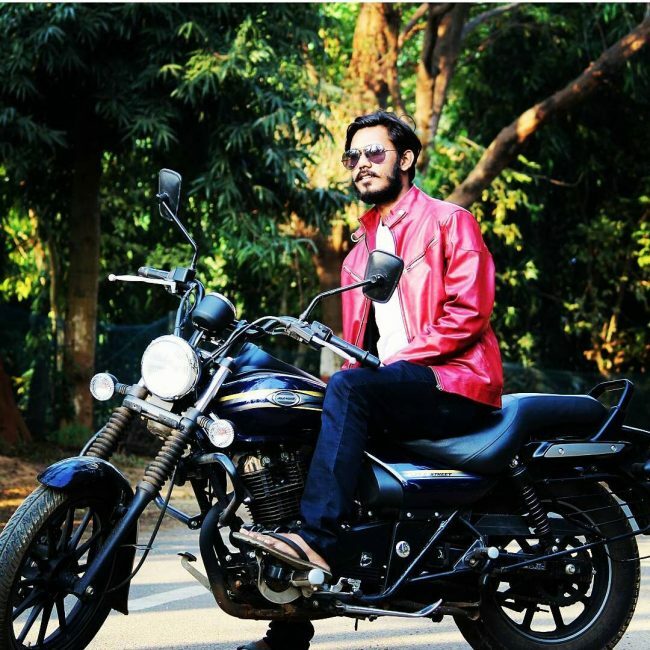 The red stylish leather jacket, the black T-shirt, and the blue jeans will make you look really handsome. Who wouldn’t want to look like the king of pop himself? 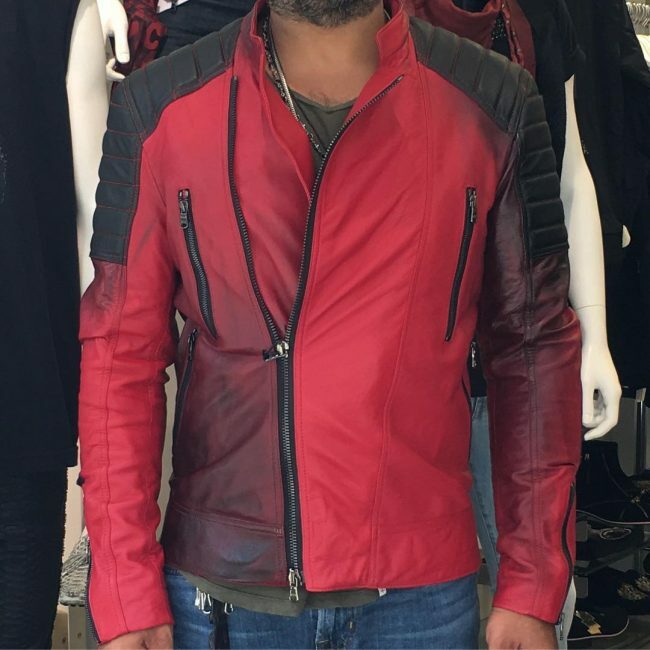 If you have watched Michael Jackson’s thriller, this jacket should be familiar to you. It will look great with Air Jordan shoes that have a touch of red in them. This is a nice casual look that you should try sometime. A red jacket will look absolutely great if you match it with checked red pants. A white shirt or T-shirt will go well with this look. 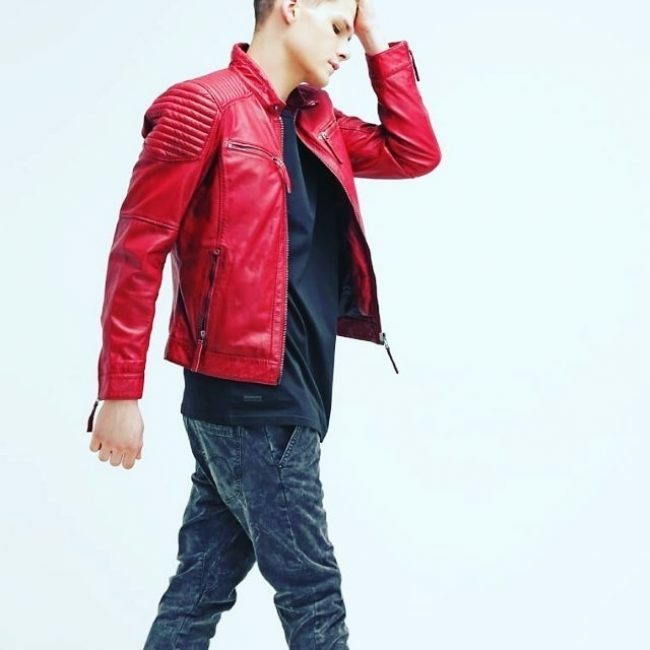 A red leather jacket, a white T-shirt and eggshell looking pants and shoes will be a great look to rock in fall. A cool haircut will be a great way to accentuate this look. 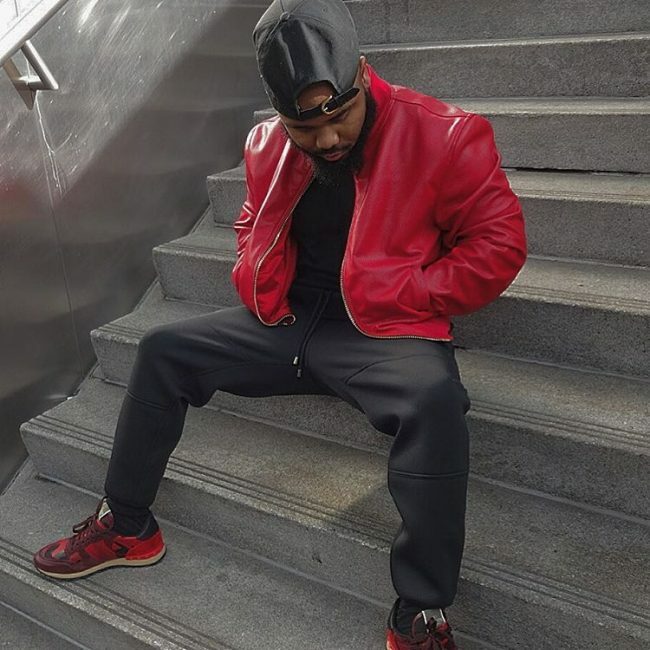 An all black look can be a great way to style a red jacket. The black ripped jeans and black sharp shooters look awesome. Black shades will look great with this look on a sunny day. 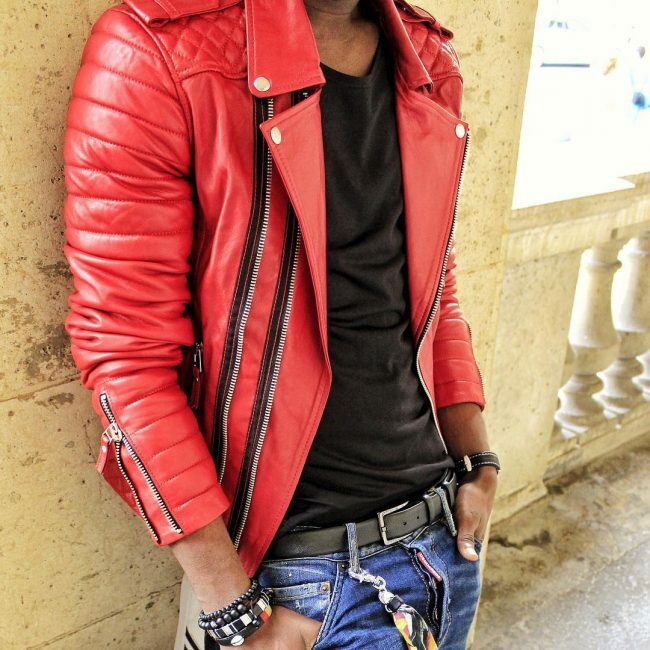 A red biker jacket that has a touch of black in it will look awesome with blue or black jeans. You can wear it with a T-shirt or shirt. 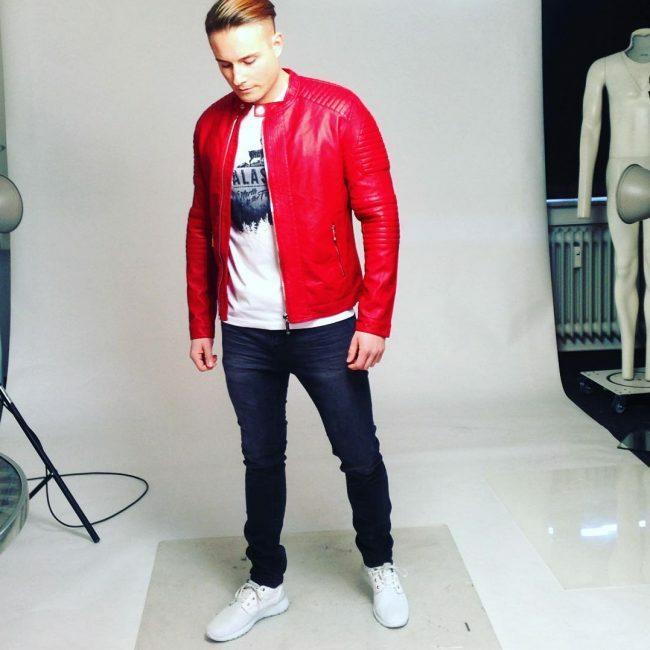 You will look great if you put on a red jacket combined with a black T-shirt and black jeans on a weekend. A silver chain and black shades with make you look really gorgeous. If you like dressing casually on Fridays, this style is a must try. 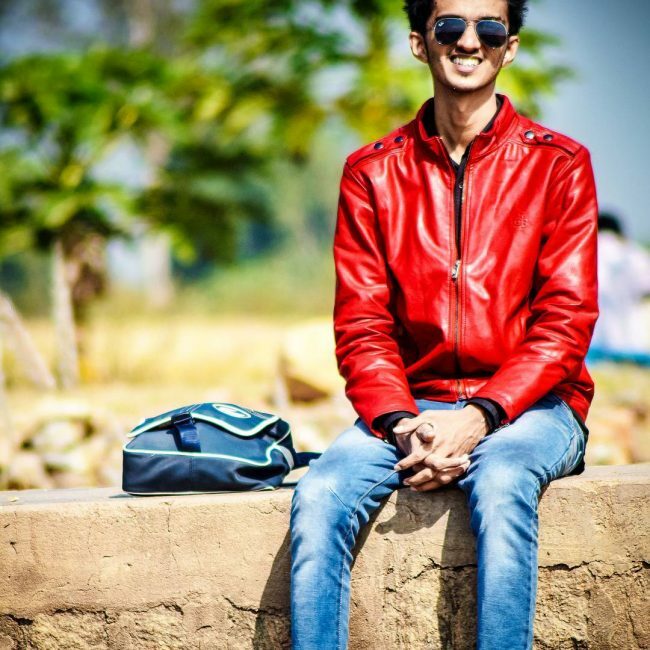 A red jacket, white tee and blue jeans is a combination that never disappoints. 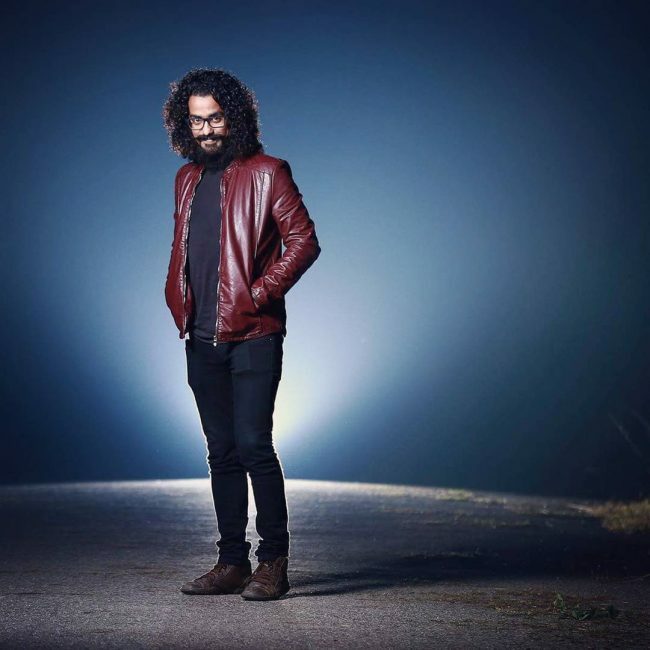 If you do not have this SOS leather jacket in your wardrobe, you need to do something about it and get it. 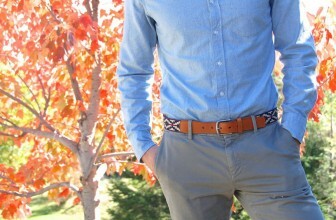 As long it is worn with a T-shirt and jeans, it will look great. 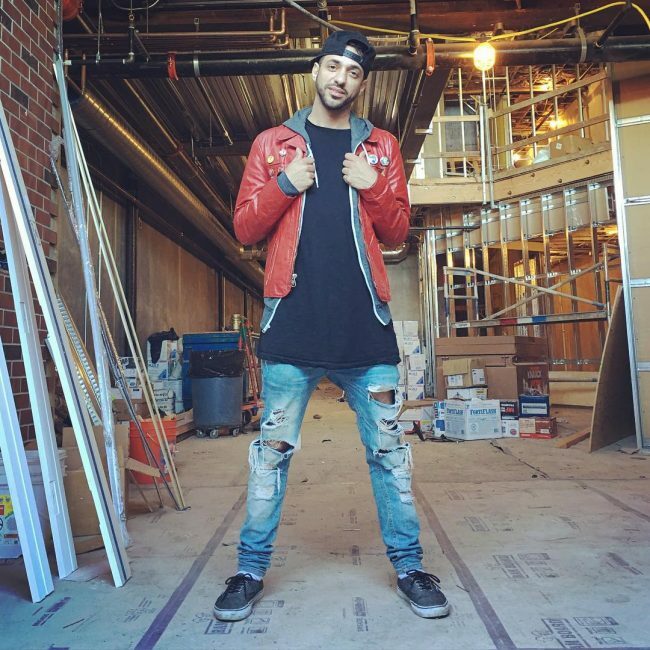 It is possible to wear a red jacket with a shirt as you can see in this picture. The best color of shirt to go with the red jacket is white. Most men appreciate simplicity when it comes to the outfits that they wear. 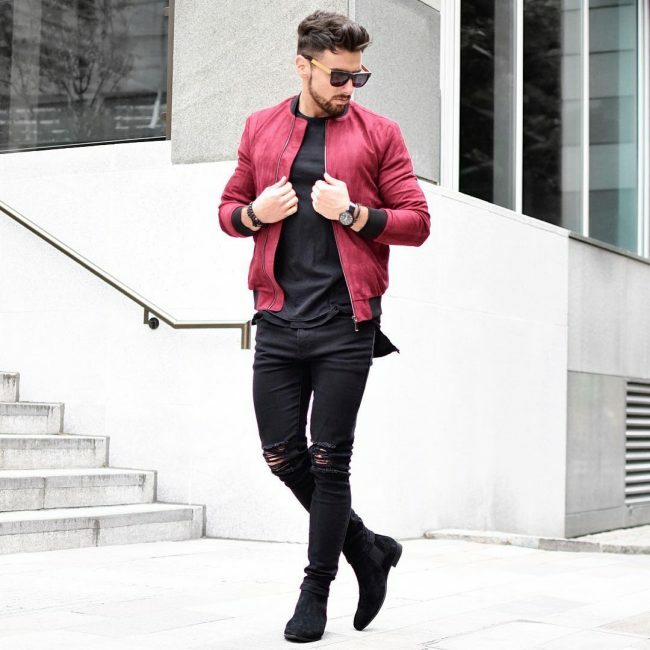 This red jacket, navy blue T-shirt and jeans combination is a simple but classy street look to try. 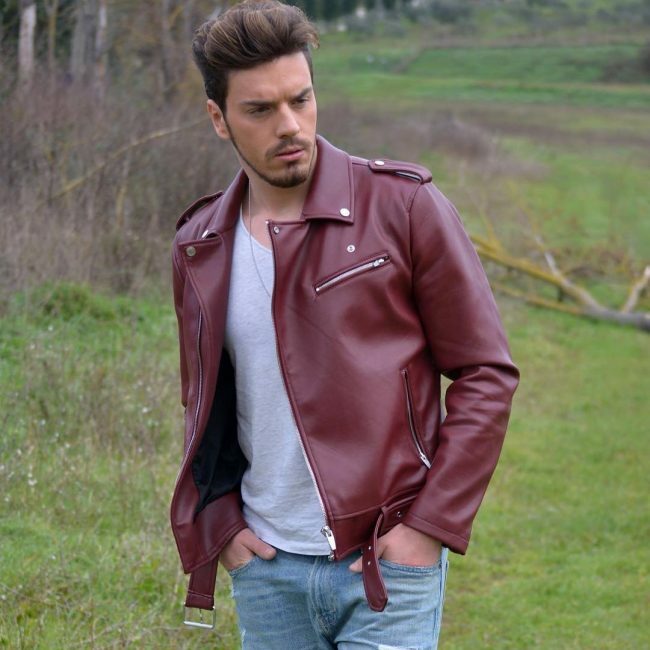 Since the red jacket in this look is very stylish, it is only fair that you pair it with a stylish outfit. The grey wide hat, grey purse, and black jeans look so great with it. 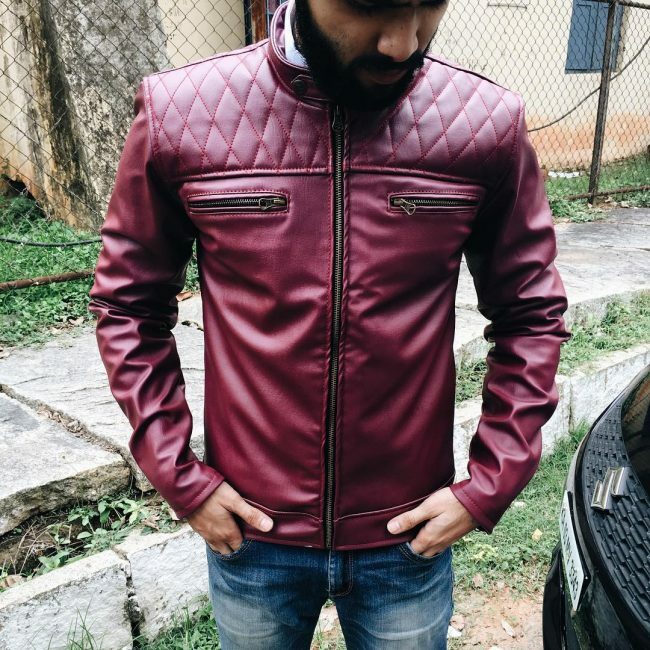 This sharp looking red leather jacket will give you a legendary and stylish look that will turn people’s heads when you are walking on the street. It will look stunning with navy blue jeans and a white tee. 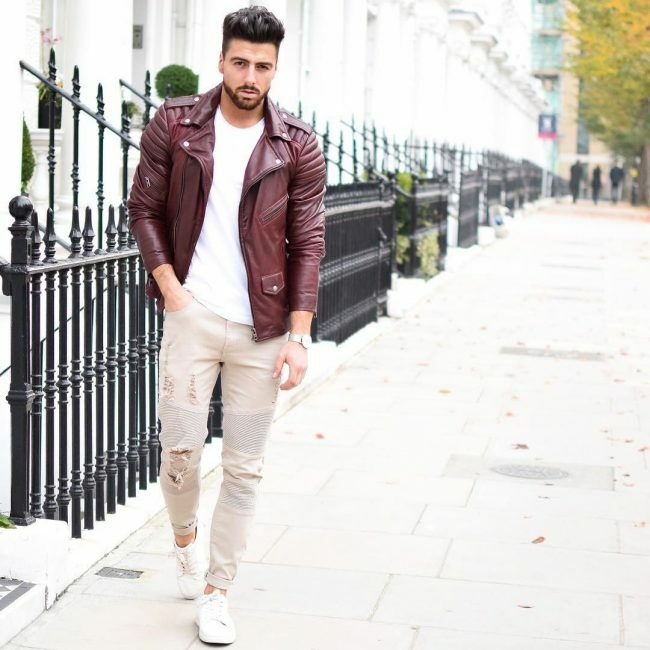 Matching a leather jacket with joggers is a great casual look for a Saturday or Sunday. 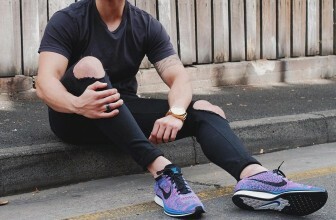 Nice sports shoes and a black or white T-shirt will be great to complete this look. 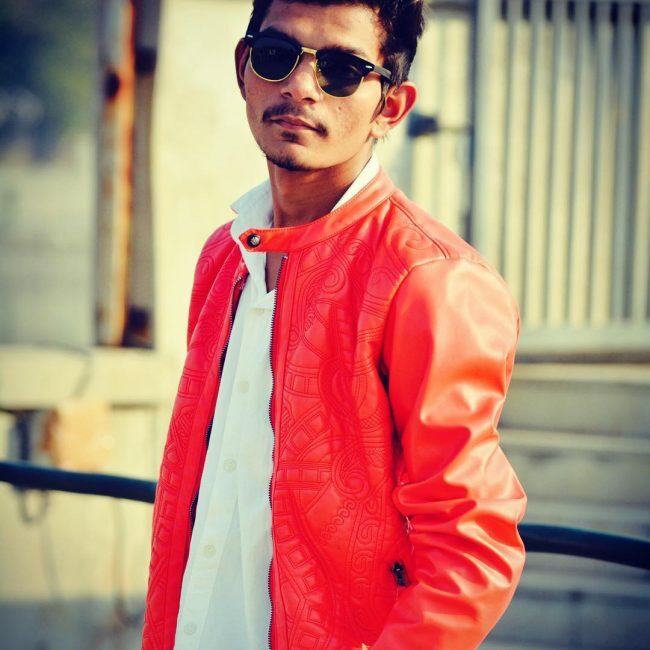 If you are a gentleman, this is the kind of style you need you rock if you are wearing a red jacket. The grey tee and blue jeans are perfect for the red jacket. With this style, you people will think that you are a rock star. 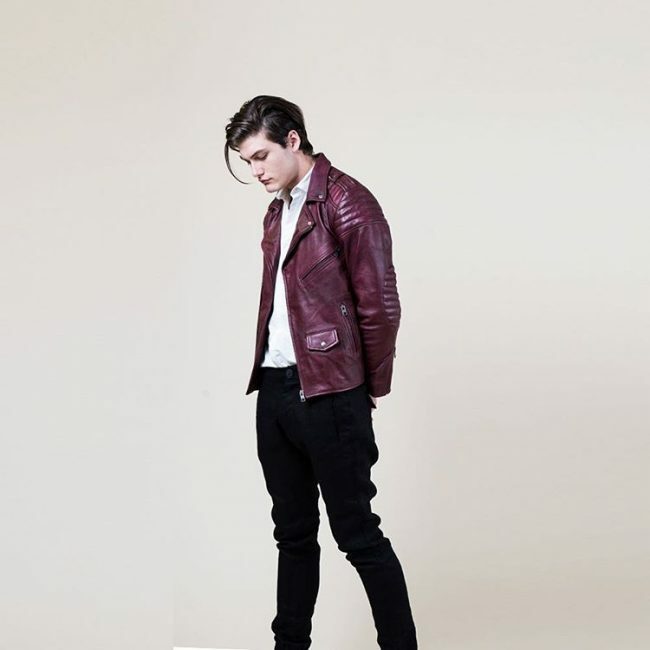 The oxblood red look of the leather jacket looks perfect when combined with a white shirt and black jeans. 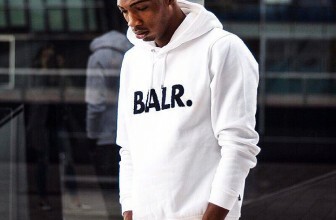 This is a nice style to include in your street wear collection. The shade of red for the jacket looks lovely. The black boots, black jeans and grey T-shirt that it is paired with look great too. 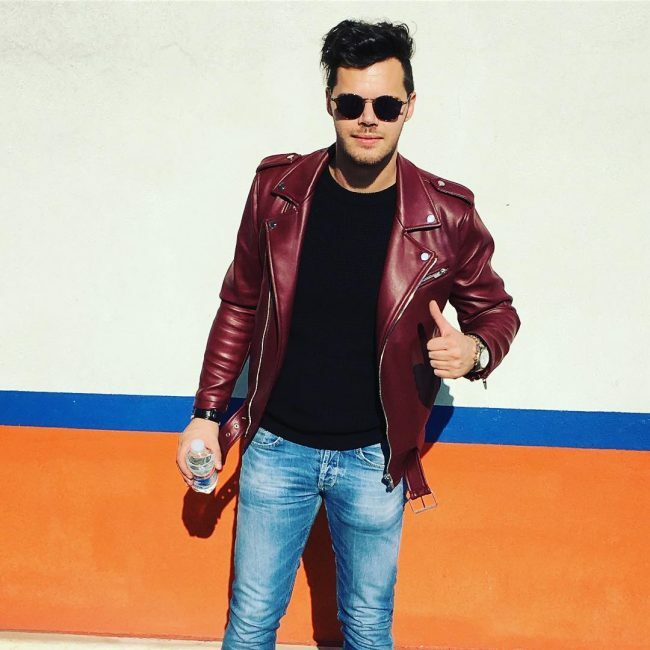 If you are a man with street style, you will appreciate the way this leather jacket looks. The blue jeans and black T-shirt look awesome with it. 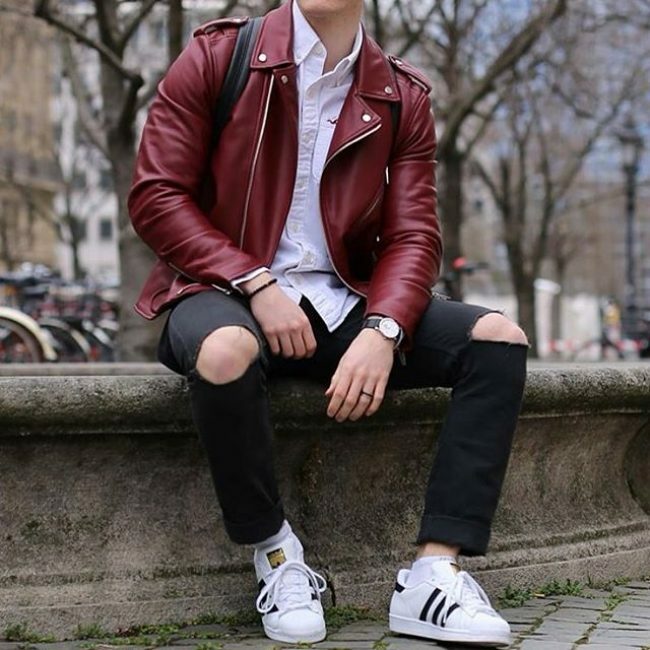 A red jacket, white shirt, black ripped jeans and white sport shoes is a combination that will leave people gazing at you in awe. 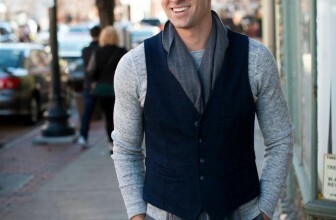 You will look really handsome if you dress like this. 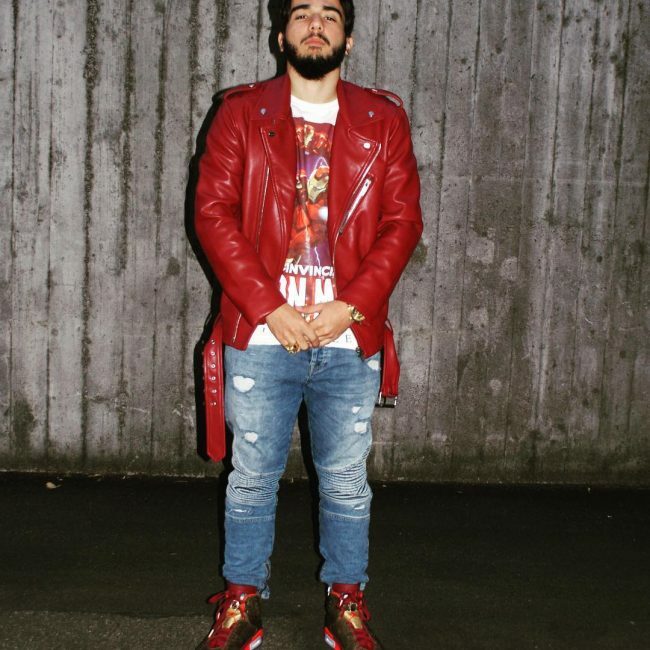 If you love including an old school touch to your outfits, this is how you need to rock a red leather jacket. The blue jeans and blue shoes look good together as well as with the rest of the outfit. 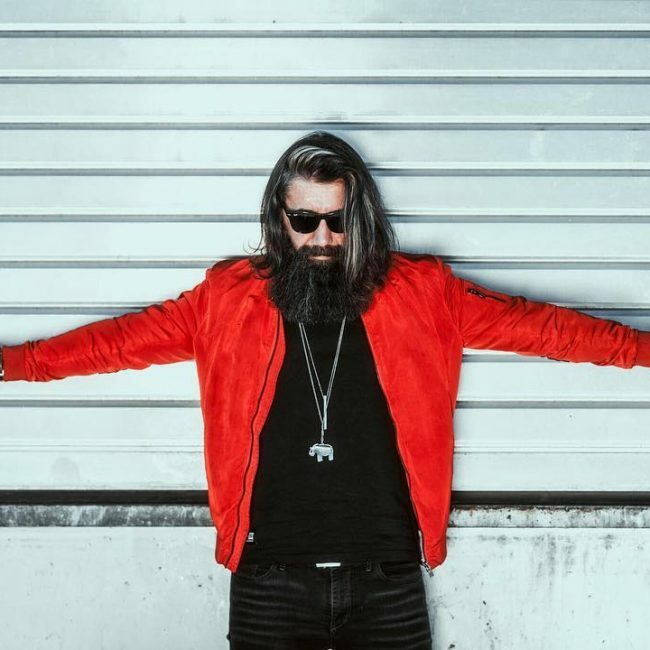 A hooded red stylish leather jacket combined with blue ripped jeans and a black T-shirt is a perfect weekend look for younger men. A black cap will look great with this look. You will find this style to be suitable if you appreciate a rugged look. 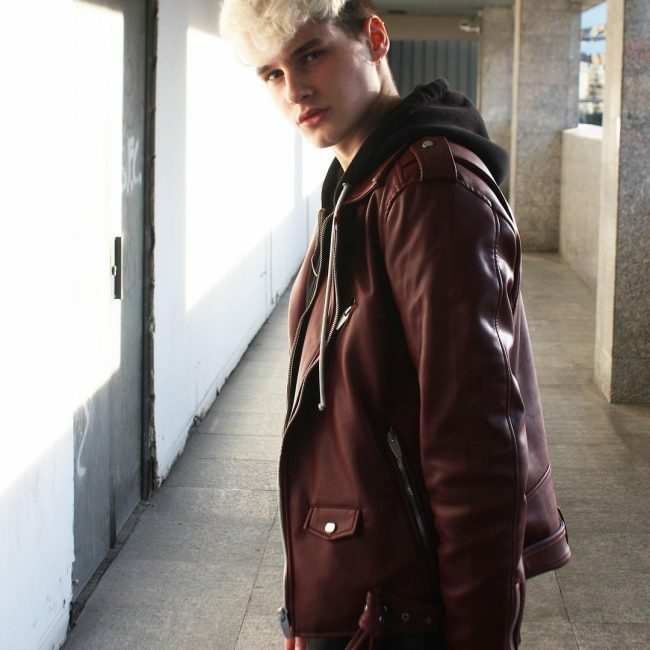 The hooded leather jacket is perfect for winter and will go well with blue jeans and a baggy black T-shirt. There are endless ways to style a red leather jacket. The styles mentioned above are just a tip of the iceberg. 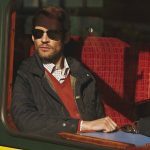 The jacket can go with pants, joggers, T-shirts, shirts, sports shoes, sneakers and any other outfit you have in your wardrobe. It is just a matter of choosing the right colors and knowing how to match the outfits well.